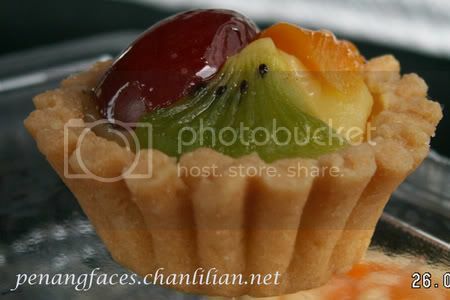 Since I often get ‘hate’ mails and comments like ‘I HATE YOUUUUUU’ for blogging about local foods, I decide to blog about muffins and tarts. Hopefully those Malaysians staying abroad will finally say, ‘aha, I can get better muffins and tarts over here’ and will ‘hate’ me less. My all time favourite muffin is from Continental Bakery at Jalan Swatow/Jalan Bawasah junction. 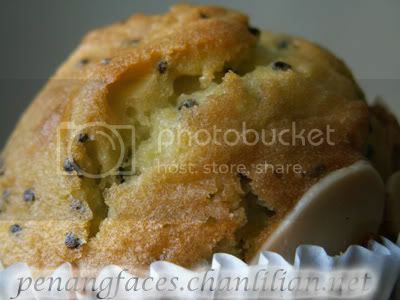 This is the kiwifruit/poppy seeds muffin with almond flakes. They also have fantastic cream puffs that taste more like cream cheese than custard. The photo doesn’t look too good, so I am not posting it. Fruit tart. The ones sold by Delifrance is way too big. I found this tiny one from Mr. Ho Fine Food (in Penang). Just the right size. Yummy too. Hmmm….what else? Nothing liao. I do not fancy pastries and puffs. Just that I ran out of things to write today. Oh ya, today is Good Friday and it is Hot Cross Buns day. I did not get any ‘cos I am stranded at home with no car. But my toddler can sing the song, ‘hot bun bun’. Ahhh….music to my ear.